I find $1000 worth of superballs. How many balls is that? If they cost $1 each that’s 1000; if they cost 50 cents each that’s 2000; if they cost $1.50 that’s, um, somewhere in between. Or less? No, more. No, less. Definitely less! Is it? Premise: I find $1000 worth of superballs. Result: My head explodes trying to do maths. They are colourful bouncy balls made of rubber. Rubber is a natural substance, so that’s okay. Of course, lava and human excrement are also natural substances, but not very nice ones; or particularly good for the environment. Better if they are made of plastic. Recyclable plastic. But what if they’re not? Plastic doesn’t bounce much so they might need an additive and then no longer be recyclable and I’ll be murdering the planet. Result: My head explodes trying to do green maths. Where do I find these killerballs? In the street? Loose on the ground? How will I gather them all before they harm the environment, choke little animals or are stolen by the neighbours? In a box, then. How big a box? How big are the balls? Can I carry it by myself or will I need a crane and a van? What will that cost? Will using a crane and a van increase my carbon footprint and do more damage than if I just left the superballs to fester in the street? Result: My head explodes from question mark overload. They’re in a building you say? Can I claim them once I’ve been released from prison, having served two years for breaking & entering and burglary? Result: I make ‘friends’ with a girl called Bill and start a new life on my parole, releasing environmentally friendly bouncy balls into the wild. I find a $1000 worth of superballs. Where they imported from the States? Is it Australian dollars? What’s the exchange rate on that? 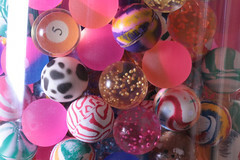 Premise: I find £632.651/£654.001 worth of superballs. Result: I lobby the British Government to join the Ausmerican Dollar system. Let’s say, for the sake of argument, a WordPress prompter comes to my house in the dead of night; leaves a reasonably sized, reasonably priced box of environmentally friendly superballs on my doorstep; and a note asking me to write about what I would do. Premise: I find $1000 worth of friendly superballs on my doorstep, and a note from WordPress. Result: I close my account. I have to: crazy WordPress prompters are stalking me. My advice: ignore them. You could find better things to do with your time, like writing poetry. The prompters must open your posts with fear in their hearts. Thanks for the lovely laugh. I expect they’ll be sending you over to Blogger quite soon now. Don’t be putting ideas into their heads! I did not know what superballs were. I had no intention a doing that topic anyway but if I had..what I would have said… is show me the man with 1000 superballs…. I love how you question, I should do more of that. I see prompt no matter what I feel honor bound to take it seriously and answer. I must answer prompt. I am part of dailypost2011, I must answer. Ha, Ha. You are very clever. I always laugh after I read your posts, thank you. Your creativity could bring about world peace, of course it could also get your killed as not enough people want peace and so many of those have no sense of humor. Don’t mock God or Mohammad. As I have noted I love you, but I won’t stalk you, just enjoy what you have to offer. Do you do standup? . I wonder if whoever conceived this prompt has heard back yet about their application to Mensa? Our gym instructor tossed a thousand hand-sized rubber balls in the pool one day. They flew everywhere, smacking people in the face. The person who got a wet bathing suit in the face was not happy. Turns out the instuctor had thrown the suit in with the balls the last time she used them. BTW At 1.50 per ball, if you spent a $1000 you would get 666.6667 balls. At 1.00 per ball, you would get 1000 balls; At 2.00 you would get 500 balls. ??? At 50 cents you would get 2,000 balls. $1.50 is not halfway between 50 cents and 1.00. .75 cents is and would buy you 1333.3334 balls. We wouldn’t have to wonder who has the most balls! Thanks for the laugh. 😀 One of your best ever, Tilly. What a load of superballs..
Give them back?? But they’re FREE! This should be FP’d!! Brilliant Tilly. You’ve given me a great start to the day. I love it, love it, love it! So I pressed it. Hope I did it right!! I bet wordpress thought nowhere near as much about putting together their prompt (and it is quite contrived) as you did dissecting it! i used to be obsessed with super balls. haha loved this. i’d love to get on your blogroll. i wrote a couple blogs about weight. LOL…. best laugh of the week without a doubt. perhaps even the month. my kids like to stick them in my potted plants. not sure what the logic is behind that. colorful rocks? drainage? You’re post is pure genius. I cant say anything else, you made me laugh so hard, you cant imagine. Well done. I think you had a great time writing this. I would take my hat of if I had one! You’re right: I did have a great time writing this.